NoSQL is a broad class of database management systems that differ from classic relational database management systems (RDBMSes) in some significant ways. These data stores may not require fixed table schemas, usually avoid join operations, and typically scale horizontally. NoSQL. 요즘 참 많이 듣는 단어. google, amazon, digg, twitter 등 적용 사례도 볼 수 있어 더 쫄깃쫄깃하게 느껴지는 키워드이기도 하다. 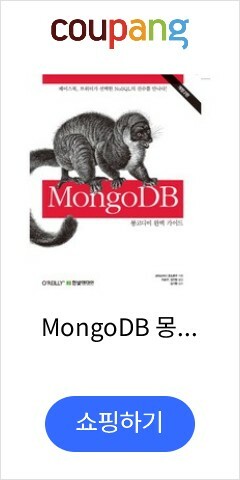 NoSQL DB 종류가 엄청 많은데, 그중 문서 기반으로 2009년부터 시작해 관심을 많이 받는 MongoDB에 대한 책이다. 참고로 최근에 발표자료를 만든 LevelDB는 key/value 기반이다. MongoDB 사용 기초지식을 얻을 수 있는 책. 하나하나 따라 하며 사용법을 익히는 구성이다. 난 DB에 관해선 기초지식만 있는 터라 ‘아~ 이런거구나’라는 수확을 얻은 책.